We publish research to share new findings and increase our understanding of various subject matters. As we discussed in a prior post, when editors select an article to publish, one of the key factors they consider is your methodology. 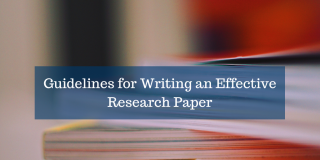 A research paper contains not only the results but also how you got the results and how you arrived at the conclusions you did. We include a Methods section in our papers so that others can reproduce our experiments and evaluate the validity of our results. So, what does that mean for you? Your Methods section should be clear. It should explain both the actual procedures undertaken and the methodological choices made in designing your study. In other words, readers should understand what you did, how you did it, and why you did it. 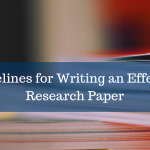 In theory, the Methods section is often drafted first because you would have written much of this during the initial stages of your research project. 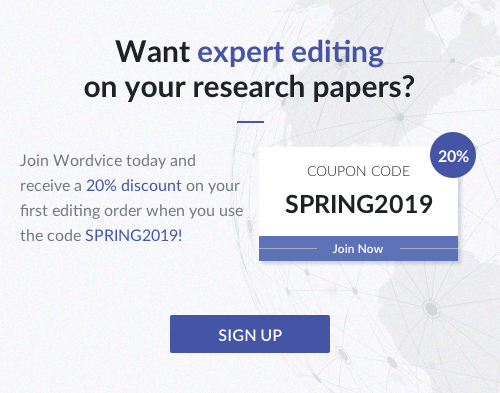 This section is also usually the last to be finalized once you have finished your research because you would need to adjust the descriptions to (1) reflect any adjustments you made while conducting your research and (2) incorporate feedback from co-authors and reviewers. Essentially, the Methods section should explain how you answered your research question. 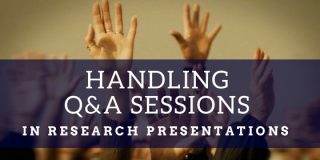 At a basic level, you would need to describe how you chose the test subjects and variables, how you manipulated or observed those elements, how you collected data, and how you analyzed all of the preceding information. Think about the traditional W-H questions (who, what, when, where, why and how) while drafting this section. However, remember that you’re not cataloging every step you took. Rather, you want to give a comprehensive overview of key tasks that others would need to repeat your experiment. How should I format the Methods section? Study design. This part should describe how you planned to address the purpose of your research and how you intended to answer your research question, including any feasibility issues. Your aim is to address how well the study design you implemented was able to control random and systemic errors. By addressing these points, your readers will appreciate the validity and precision with which you arrived at your results. Test subjects (selection criteria and methods). The purpose of discussing these elements is to address questions readers might have about the results you presented earlier in your paper. Data collection (criteria and methods). Demonstrate the reliability of your methods. 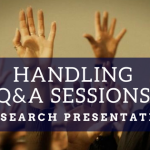 Did you adequately address bias and control any variables that could have impacted the results you presented in your paper? Data analysis. By describing how you analyzed the data collected, you will address some of the concerns readers may have had about the conclusions you drew from that data. TIP: Use subheadings to your advantage. They can help distinguish various steps taken in your study and identify the different procedure types or test subjects used. Typically, methods are organized chronologically or by procedure type, but you can organize them in any manner that will help you clarify your Methods section and make it logical for your reader. The following is a table summarizing some of the factors you may want to consider while drafting or revising your Methods section. We have organized the table based on the four general headings listed above. This list is not comprehensive but merely serves as a guide to help you reflect on aspects you might want to include in your Methods section, where applicable. What do we currently know about the research topic? What type of study are you conducting (descriptive, analytical, comparative, interventional, observational, etc.)? What variables will you use, and which subjects will be exposed to which variables? How often and when will the data be collected? How can you control all the factors that might affect prediction models and outcomes? Do you have to adjust design because of some feasibility issues? If so, what factors? Ethical considerations (all animal or human studies must discuss factors like ethics committee approval of research protocol, informed consent of human subjects, etc. Study setting (time, place, etc. ), where applicable. For living subjects (humans and animals): demographic and clinical conditions, gender, weight, species, age, special characteristics, living conditions, etc. Any preparations of subjects made before starting experiments. Sampling method, including target population, sampling frame, instruments used, and any stratification, clustering or weighting. Recruitment method and its effectiveness, including profiles of any subjects that refused (where applicable). For comparative studies: group allocation and randomization procedures. Follow-up procedures for longitudinal studies. Variables measured (identify only the key predictors and all outcomes of those variables). Methods and instruments used to collect data (include information such as an instrument’s manufacturer and model, calibration procedures, and other information necessary to allow others to reproduce your experimental results). Bias controls (e.g., blinding procedures). Descriptive statistics (e.g., means, medians, standard deviations, etc.). Inferential methods (include confidence intervals, hypothetical testing methods, and regression models or other modeling procedures used). Methods used to address confounding variables. Adjustments made to sampling methods and weighting procedures. As you contemplate the above factors, also consider the following dos and don’ts when drafting the Methods section. Use past tense (you are writing about what you did, so that this makes sense). Don’t mix results with procedures; only describe procedures in Methods. Exclude lengthy explanations and background information (they belong in the Discussions section). 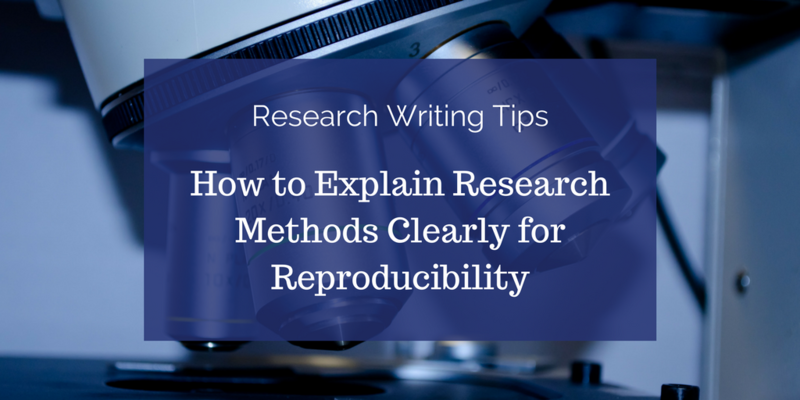 Only include essential information needed to reproduce your experiment. Strip your procedures to the bare minimum required. If you think you are leaving out an important point, ask yourself, “If a reader followed my notes, would they definitively produce different results without the information I wanted to exclude?” If so, then include those details. Give precise measurements, including units, and disclose any errors of measurement. Don’t repeat descriptions of already published methods. Instead, use numbered references to indicate the method was previously described elsewhere and only include information about any new additions or variations you made to the original method. 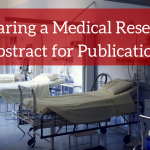 With these tips in mind, you will be well on your way to drafting a clear and meaningful Methods section.